Central Jakarta Bina Marga Sub-dept. paints three public transport shelters along Jalan Abdul Muis, Gambir Urban Village, Gambir. Painting is done to beautify those dull and rusty shelters.
" We paint those shelters with paint for metal in yellow and green colors"
"It is done by our unit in road division. We paint those shelters with paint for metal in yellow and green colors thus it will look cleaner and more comfortable for people while waiting for angkot (public minivan)," mentioned Sukowibowo, Head of Central Jakarta Bina Marga Sub-dept., Friday (8/31). 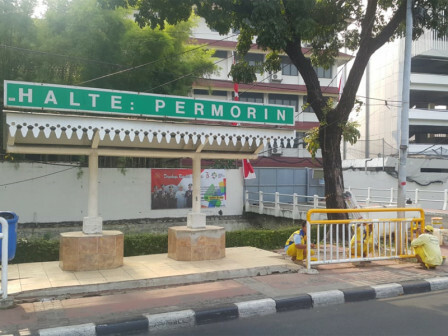 According to him, six personnel deployed to paint those shelters which located behind RRI building and Defense Ministry and also near Budi Kemuliaan intersection. "This is a part of our maintenance. Besides shelter, we also paint rusted railing and complete it by tomorrow," he stated.